Bishop of Coventry and Litchfield's Proxy. 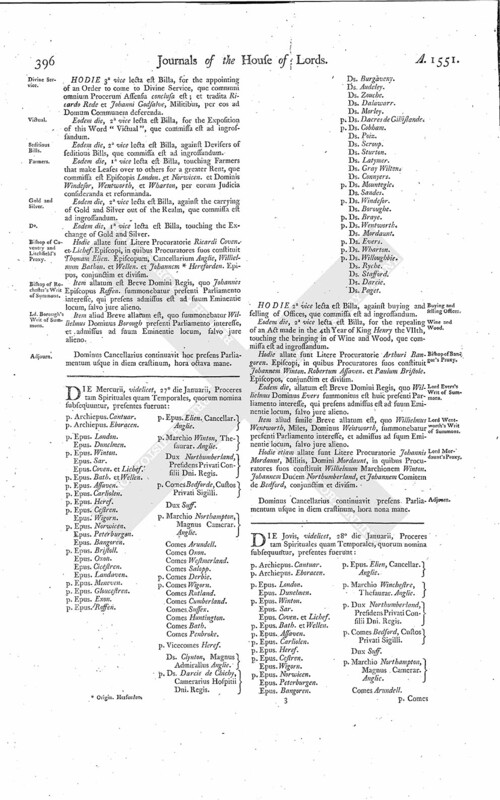 Bishop of Rochester's Writ of Summons. Ld. 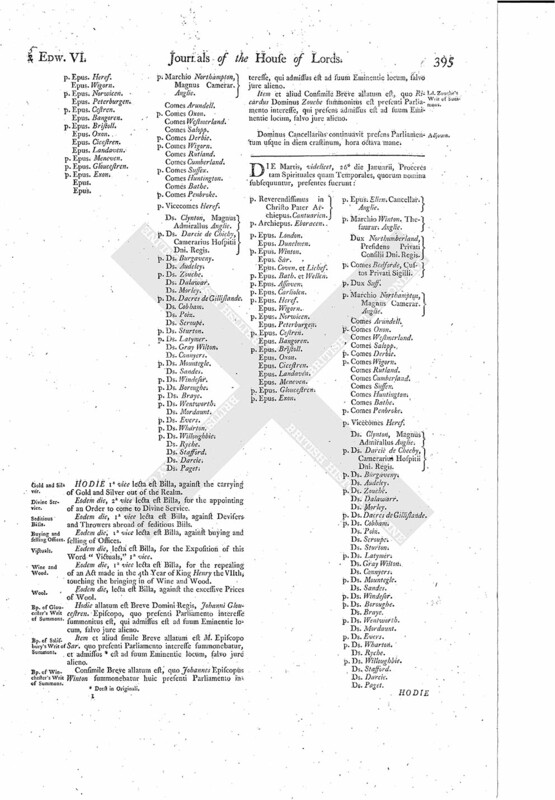 Borough's Writ of Summons. p. Reverendissimus in Christo Pater Archiepus. Cantuarien. p. Epus. Exon. p. Epus. Elien. Cancellar. Anglie. p. Marchio Winton. Thesaurar. Anglie. Dux Northumberland, Presidens Privati Consilii Dni. Regis. p. Marchio Northampton, Magnus Camerar. Anglie. Ds. Clynton, Magnus Admirallus Anglie. HODIE 3a vice lecta est Billa, for the appointing of an Order to come to Divine Service, que communi omnium Procerum Assensu conclusa est; et tradita Ricardo Rede et Johanni Godsalve, Militibus, per cos ad Domum Communem deferenda. Eodem die, 2a vice lecta est Billa, for the Exposition of this Word "Victual", que commissa est ad ingrossandum. Eodem die, 2a vice lecta est Billa, against Devisers of seditious Bills, que commissa est ad ingrossandum. Eodem die, 1a vice lecta est Billa, touching Farmers that make Leases over to others for a greater Rent, que commissa est Episcopis London. et Norwicen. et Dominis Windesor, Wentworth, et Wharton, per eorum Judicia consideranda et reformanda. Eodem die, 2a vice lecta est Billa, against the carrying of Gold and Silver out of the Realm, que commissa est ad ingrossandum. Eodem die, 1a vice lecta est Billa, touching the Exchange of Gold and Silver. Hodie allate sunt Litere Procuratorie Ricardi Coven. et Lichef. Episcopi, in quibus Procuratores suos constituit Thomam Elien. Episcopum, Cancellarium Anglie, Willielmum Bathon. et Wellen. et Johannem (fn. 2) Hereforden. Epipos, conjunctim et divisim. Item allatum est Breve Domini Regis, quo Johannes Episcopus Roffen. summonebatur presenti Parliamento interesse, qui presens admissus est ad suum Eminentie locum, salvo jure alieno. Item aliud Breve allatum est, quo summonebatur Willielmus Dominus Borough presenti Parliamento interesse, et admissus ad suum Eminentie locum, salvo jure alieno. Dominus Cancellarius continuavit hoc presens Parliamentum usque in diem crastinum, hora octava mane.